Location: Los Angeles, Hollywood, California, U.S.
¬ Larry Campbell - fiddle on Rooster Rag and Salome. ¬ Sixteen studio albums and over four decades into a career that started inauspiciously in 1971, the key elements of the Little Feat sound remain. Swampy rhythms? Check. Nasty, cutting slide guitar? Present. A funky combination of blues, country and rock and roll? Oh yeah. Quirky idiosyncratic songwriting? Well, three out of four ain’t bad. ¬ With keyboardist Billy Payne as the lone remaining original member, Feat stomp and strum their way through a pretty good batch of new tunes that capture the band’s distinctive musical gumbo but aren’t exactly classics on the order of Lowell George’s timeless songs that remain the backbone of the group’s raison d’être. Still, with help from Grateful Dead lyricist Robert Hunter, they’re solid enough and the veteran band sounds fresh, inspired and revived if not exactly young and hungry on their first studio album of original material in twelve years and after losing irreplaceable founding drummer Ritchie Heyward. Considering their time in the cult trenches, that’s plenty impressive. ¬ With the tragic passing of founding member Richie Hayward, Little Feat suffered what is undeniably the band's greatest loss since the untimely death of its mastermind Lowell George. But the venerable group has enlisted some redoubtable reinforcements for its 16th studio album Rooster Rag. ¬ New drummer Gabe Ford (sideman to Jorma Kaukonen and Ruthie Foster, nephew of guitarist Robben) acquits himself stylishly throughout Rooster Rag, never more so than on the tightly-wound patterns he concocts with bassist Kenny Gradney Jr. and percussionist Sam Clayton during “The Blues Keep Coming.” And the new enlistee's peripatetic approach on "Salome" contrasts effectively with the slow swooping slide guitar from Paul Barrere. ¬ It's rare for any band to have lyrics as erudite as their own instrumentals, but that's exactly what Robert Hunter, long-time wordsmith for the Grateful Dead, supplies on companion pieces "Rag Top Down" and the title song; on the latter, dobro twirls around Larry Campbell's violin in acoustic sounds not altogether new in the Little Feat canon, but certainly not often prominent in their discography. ¬ The band is in full flight on "Candyman "Blues," the opening cut displaying as much of the crackling energy of the horn-laden Fred Tackett original "One Breath at a Time." With Willie Dixon's "Mellow Down Easy"—which in its high-stepping elemental beat is anything but (see another of Tackett’s tunes, “Tattooed Girl” instead)--this Mississippi John Hurt number bookends the other ten other cuts on an album of expansive production. ¬ Yet Feats' familiarity with its blues roots supplies a stable point of departure in an otherwise ambitious, not to mention courageous, diversity. Guitarist Tackett, who's been on board since the group’s reformation in 1988, chips in with four distinctive originals here, and one, "Church Falling Down," is built on the deep NOLA-derived rhythm at the foundation of the original six-man Little Feat. ¬ On Rooster Rag, Little Feat sound more like themselves, and naturally so, than they have in years. Hopefully this album lays a foundation for similarly courageous projects from this resourceful band. ¬ Rooster Rag is the fifteenth album of original material by American rock band Little Feat due to be released in the summer of 2012. It marks their first original album since 2003's Kickin' It at the Barn and the recording debut with the group of new drummer Gabe Ford who replaced the late Richie Hayward. Four of the songs were written by former Grateful Dead lyricist Robert Hunter in collaboration with keyboard player Bill Payne now the only musician to have played with every line-up of the group. ¬ Surprisingly, Paul Barrere the group's main writer/singer has only been credited with writing on one track, but his usual co-author Fred Tackett contributes four songs, all of which have appeared on his solo albums but not all of which he sings lead on. The song Candy Man Blues by Mississippi John Hurt has been done by the band live for some years and appeared on their 2005 collection Barnstormin' Live. ¬ The order of tracks was confirmed on Little Feat's website on June 10th. Location: New Orleans, Louisiana, U.S.
¬ Kenny Gradney, a native of New Orleans, is a member of the band Little Feat. He joined after their second album, replacing founding bassist Roy Estrada in 1972. In addition to his work with Little Feat, Gradney has played and recorded with many notable musicians, including Delaney & Bonnie, Bob Weir's Bobby and the Midnites, Jazz Is Dead, jazz drummer Chico Hamilton, Warren Zevon, Robert Palmer, Mick Fleetwood, and Carly Simon. ¬ Sam Clayton has been a singer and percussionist, primarily focusing on drums; conga and djembe, throughout his musical career. He is best known for his membership as percussionist and supporting vocalist with the American rock band Little Feat since 1972. ¬ Session workSam Clayton is also a respected session musician and has played with, among others Duane Allman, Jimmy Barnes, Jimmy Buffett, Valerie Carter, Freddie King, Robert Palmer, Bonnie Raitt, Bob Seger and Travis Tritt. He is the brother of singer Merry Clayton. ¬ Clayton was introduced to Little Feat, an eclectic band drenched in Southern rhythms, funk, and alternative rock, by his friend Kenny Gradney with whom he had played behind Delaney & Bonnie, and who was to replace original bassist Roy Estrada. Gradney recommended Clayton to the band as he knew both men needed work following Delaney & Bonnie's split up following their divorce. ¬ Sam made his debut with Little Feat on their third album Dixie Chicken in 1973. He also played congas on Bonnie Raitt's 1977 song, "Sweet Forgiveness", on her album of the same name. As time went on, his vocal talents as well as his percussion came to the fore, which gave the band a funkier sound. ¬ Originally a session player on guitar, mandolin, and trumpet, he is best known for his longevity as a member of the band Little Feat. ¬ In 1988 Little Feat reformed despite the absence of their former front man, and prolific singer, songwriter, and slide guitarist, Lowell George. 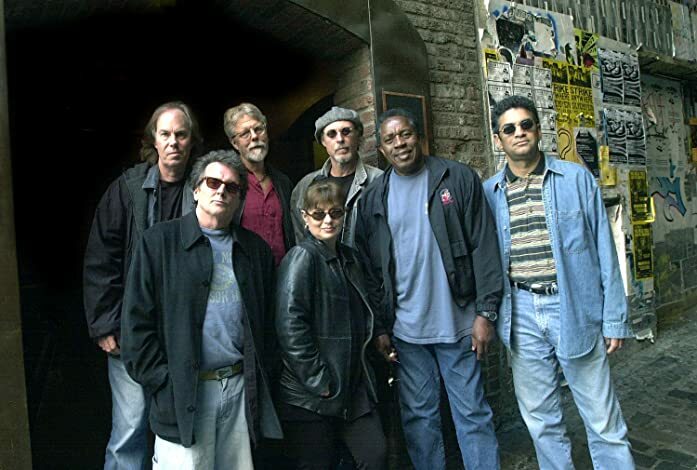 The regrouped Little Feat included former members Paul Barrere, Richie Hayward, Bill Payne, Kenny Gradney, and Sam Clayton, with the addition of Tackett and Craig Fuller. All had been former members of Little Feat, except Tackett, who had previously made songwriting contributions and session work for the band. Fuller left in 1993, to be replaced by female vocalist Shaun Murphy who remained with the group, until 2009. Tackett has remained with Little Feat since the day he joined, and has become an integral member of the band. ¬ Fred Tackett has played a pivotal role in Little Feat's music. In addition to his guitar work, he plays trumpet and mandolin and has co-written several of their songs, forging an active and regular writing partnership with Paul Barrere which has produced such songs as "Marginal Creatures" and "Night On The Town". The 2003 album Kickin' It at the Barn featured Tackett's debut as a lead vocalist on his own song "In A Town Like This" which was also the title track from his solo debut album released that year. ¬ Current drummer for Little Feat. He was born into a musical family. His father, Patrick, is also a musician as are his uncles Mark Ford and Robben Ford. He plays drums, guitar and keyboards. ¬ Musical careerFord spent his early career in the San Francisco Bay area playing with a popular pop band called 008. He played the blues at the same time by playing and recording with his uncles as well as Chris Cain and Michael Osborn. In 2006 Ford released his first self titled solo album. Other musicians that play on the album are Robben Ford, Chris Cain, Joe Colgan, Mark Ford, John R Burr, Dewayne Pate, Chris McGee and Johnny Bennett. ¬ In early 2009 Ford backed his uncle, Robben Ford, on drums when he toured with Jorma Kaukonen and Ruthie Foster. ¬ Ford had been the drum technician for Little Feat since 2006. In 2009 original Little Feat drummer Richie Hayward announced he was leaving work indefinitely to pursue treatment for a severe liver disease. Ford filled in on drums. After Hayward's death in 2010, Ford joined the band as a full-fledged member.